Note: Binge alcohol use is defined as drinking five or more drinks (for males) or four or more drinks (for females) on the same occasion (i.e., at the same time or within a couple of hours of each other) on at least 1 day in the past 30 days. Data Source: Center for Behavioral Health Statistics and Quality. (2016). 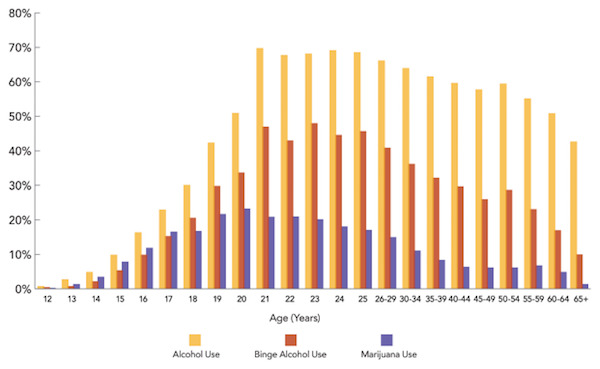 Results from the 2015 National Survey on Drug Use and Health: Detailed tables. Rockville, MD: Substance Abuse and Mental Health Services Administration. This entry was posted in Medicine and Society Data Watch on November 23, 2016 by Genevra Pittman.